Adding great HTML5 games to your website has never been easier. Easy to add to your site. Our Coloring Book is highly interactive, providing kids (and adults) with hours of coloring fun. You can use your own pictures, or select from our extensive library of purpose-built coloring pages. 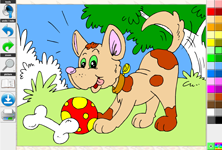 You can also group multiple coloring pages into a coloring book, providing easy access to additional pictures. Word Search puzzles are a great way to add some on-topic interactive content to your site. These types of puzzle enhance language and spatial skills, and reinforce learning of topic elements. 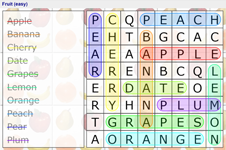 Use a pre-built puzzle, or quickly and easily create your own from any list of words. You can control the difficulty of the puzzle, and the grid is automatically generated each time the game is played so that each puzzle is unique. Also has an optional high-score feature to provide a competitive element. Register today for free instant access, and you'll be able to try out our games on your site within minutes. Registered user? Log in to access your account.